In the Autumn term York PEN will join English PEN in focusing on cases of freedom expression breaches in Turkey. Week 1 and 2 we are campaigning for the release of Muharrem Erbey. 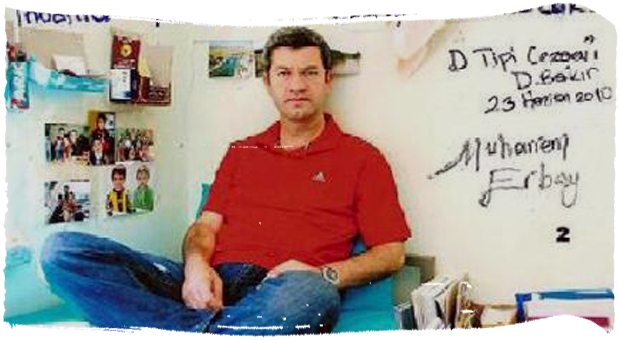 In December 2009, human rights lawyer, writer and PEN Turkey member Muharrem Erbey was arrested in Diyarbakır, south-eastern Turkey. Almost four years later, he remains in prison awaiting trial. Muharrem Erbey has worked for many years as a highly respected human rights lawyer and advocate in the southeast of Turkey, compiling reports on disappearances and extra-judicial killings in the region, and representing local individuals in provincial, national and international courts, including the European Court of Human Rights. In 2008, Erbey became Vice President of the İnsan Hakları Derneği (IHD), one of Turkey’s most reputable human rights associations, having served as President of the Diyarbakır branch for many years. In addition to his work as a human rights lawyer and advocate, Erbey is also a published writer, editor and columnist, and has written numerous articles on culture and human rights for a wide range of magazines, newspapers and websites. In 2007, Erbey co-edited a collection of Turkish and Kurdish language stories by 35 authors, which was distributed to local people for free by the Diyarbakır Metropolitan Municipality. Erbey successfully defended the mayor who had organised this publication when he was tried under a law prohibiting use of the Kurdish alphabet, a law which has since been annulled. Erbey was also instrumental in the publication of short-story collection, Missing Pedigree in 2004. The publication of his latest short-story collection, My Father, Aharon Usta, has reportedly been put on hold since his arrest. He is a member of English PEN’s sister centre, PEN Turkey, and the Kurdish Writers’ Association. Muharrem Erbey was among 80 people across the region to be arrested in connection with the Koma Civakên Kurdistan (KCK) (Union of Communities in Kurdistan), the alleged political front for the outlawed Kurdistan Workers’ Party (PKK). According to reports, members of the Anti-Terror Unit of the Diyarbakır Security Directorate took Erbey from his home in the early hours of 24 December 2009. At the time of his arrest, the offices of the IHD were searched and documentation, including archives detailing serious human rights violations that have taken place over the past two decades, was seized. Erbey has since been charged under Article 314/2 of the Turkish Penal Code (‘membership of an armed organisation’). He continues to be held in Diyarbakır D Type Prison awaiting sentencing. I have been incarcerated for the last three years… because of the speeches I have made on human rights and the peaceful resolution of the Kurdish issue at parliaments in Britain, Sweden, Belgium and at the UN in Geneva. My speeches and comments never contained words of violence. The indictment against Erbey accuses him of attempting to humiliate the Turkish state in speeches given in the Swedish, Belgian and UK Parliaments; of financing KCK with money from a grant obtained in IHD’s name from an EU Member State; of being involved in the drafting of a constitution by the PKK-linked Democratic Community Congress (KCD); of being Diyarbakir Mayor Osman Baydemir’s lawyer, and meeting with him frequently; of following a number of anti-terror trials voluntarily; of making statements to Kurdish-language satellite channel Roj TV (alleged to be the ‘PKK’s mouthpiece; of participating in various demonstrations via his press releases; of attempting to humiliate Turkish security forces; of providing KCK with morale and motivation; and of taking part in various activities in order to incite public disorder. PEN is gravely concerned that the charges against Muharrem Erbey are politically motivated, and that he is being held because of his alleged affiliation with Kurdish political parties. We are therefore calling for his immediate and unconditional release from prison, in accordance with his right to freedom of expression and association, as guaranteed by the International Covenant on Civil and Political Rights and the European Convention on Human and Democratic Rights, to which Turkey is a signatory. Read more about the case, as well as actions you can take, on English PEN’s website. This entry was posted in Campaigns and tagged English PEN, free speech, KCK trials, Muharrem Erbey, Turkey. Bookmark the permalink.